This is it! It's Showtime fifth anniversary, this time, actor/host Vice Ganda introduced their Magpasikat production number together with Korean actor/co-host Ryan Bang. He composed a wonderful and meaningful song that brings the studio audiences into tears. I really don't know how I'm going to describe what Vice and Ryan performances, but I bet this is definitely a unique and amazing production number in Magpasikat Week show segment. The meaning of the song was very good and straight to the point. 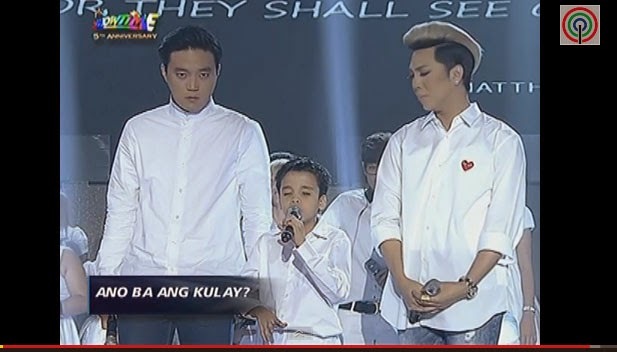 They bring to the studio's stage those kids and teens with disabilities wearing white dress to give more emphasized to the lyrics of the original composition song of Vice Ganda. Vice said, "Sinulat ko ito hindi para magpaluha. I want us to feel good about ourselves, to feel that we are so blessed." Watch them here and be ready to cry. Congratulations Vice Ganda and Ryan Bang for this so inspirational production number, this was really one of a kind performance that you gave to all your fans and to all people in the world. According to ABS-CBN News, "Magpasikat Week segment of It's Showtime, is an annual tradition where the winning team will donate the cash prize for their chosen charity." Comments or suggestions about "WATCH: Vice Ganda and Ryan Bang on Magpasikat prod number (Video)" is important to us, you may share it by using the comment box below.